Guam International Airport Authority awards Supreme the lease, maintenance, operation and management of airport fuel system at A.B. Won Pat Guam International Airport. We have hired an excellent team to execute this project, all of whom are local Nationals, and they have ensured a seamless operation from day one. 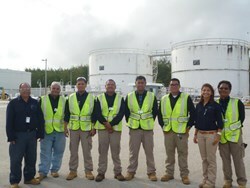 Supreme Group, a global leader in the provision of end to end supply chain solutions in challenging environments around the world, has recently commenced fuel operations in Guam following the decision by the Guam International Airport Authority (GIAA) to award Supreme a five-year contract for the lease, maintenance, operation and management of the airport fuel system at the A.B. Won Pat Guam International Airport. The airport fuel system, which currently supports eleven passenger airlines and three cargo airlines, consists of three 10,000 barrel jet fuel storage tanks and one 15,000 gallon tank for AV-gas. “I am pleased to confirm that Supreme is now fully operational in Guam,” said Andrew Benson, Account Manager – Pacific, Supreme. “We have hired an excellent team to execute this project, all of whom are local Nationals, and they have ensured a seamless operation from day one. This is an exciting project, as Guam International Airport is one of the busiest regional airports in Asia Pacific, supporting more than 300 flights per week. We look forward to further expanding our operations in this region in the near future,” Benson added. Supreme provides total end-to-end fuel supply solutions to defense forces and commercial sector clients in some of the most remote and challenging regions around the world. Supreme offers a unique breadth of capabilities – ranging from procurement, transportation, construction and storage through to technology and full site services. Today, its legacy of proven and trusted performance in challenging environments spans more than fifty years; covering 30 nations across five continents. For more information, visit http://www.supreme-group.net.